The Florida Executive Fire Officers section will provide a forum of communication and networking for Executive Fire Officer Program (EFOP) graduates, participants and those interested in the program. The Executive Fire Officers section will, through its members, support the EFOP and encourage participation of Florida Fire Service leaders. 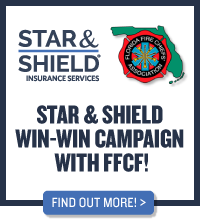 The Executive Fire Officers section will support other Florida Fire Service professional associations and the National Society of Executive Fire Officers (NSEFO). The FFCA is offering members an opportunity to select a fire service mentor for a variety of individual/professional needs. This is a component of the strategic plan of the FFCA and the Executive Fire Officer Section has agreed to lead this effort on the Association’s behalf. FFCA members will find a short biography on each of the Florida fire professionals serving in the mentoring capacity with achievements and areas of specialties to assist members in selecting a mentor. This program is designed to allow a consistent approach throughout the State and build a strong and dependable network for all to utilize. This is just one more example of the FFCA meeting the needs and requests of the membership.